Lighthouses have stood along the British coastline for hundreds of years and still play a crucial role in ensuring the safety of the global shipping industry. But in the face of increasingly stormy conditions, how resilient are these structures – particularly when you consider they are up to two centuries old. That is the focus of the ongoing research project STORMLAMP, which is being led by the University of Plymouth in conjunction with the University of Exeter and UCL, and industrial partners HR Wallingford, AECOM, WS Atkins and the Environment Agency. Funded by the Engineering and Physical Sciences Research Council (EPSRC), the investigators are using a combination of numerical modelling and field tests to demonstrate the effects of repeated impulsive wave loading. 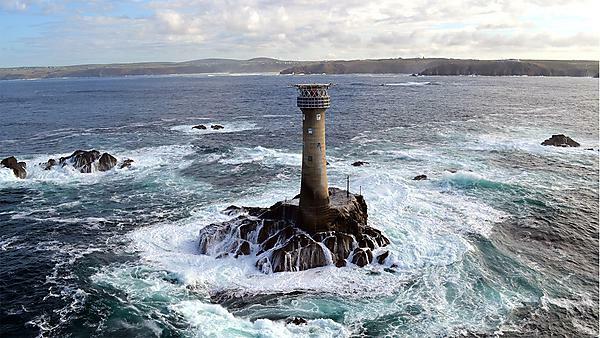 The project builds on an initial pilot, which examined the impact of storm conditions on the Eddystone Lighthouse off the south coast of Cornwall, with ongoing support provided by the UK General Lighthouse Authorities. STORMLAMP is building on that by additionally studying Bishop Rock, Wolf Rock and Longships, in Cornwall; Les Hanois, in the English Channel near Guernsey; Fastnet, to the south of Ireland; and Dubh Artach, off the west coast of Scotland. The STORMLAMP (Structural behaviour Of Rock Mounted Lighthouses At the Mercy of imPulsive waves) project was launched in 2016. It involves engineers from Exeter using specialist equipment to record the different vibrations caused by varying wave loading conditions, while colleagues at UCL then create a sophisticated multi-scale numerical simulation of the lighthouses that can be used with the data gathered on site to create long-term diagnoses. The numerical structural model is also linked with advanced physical modelling in the COAST Laboratory at Plymouth, with a range of tests being conducted in the facility’s wave tanks, and numerical (computational fluid dynamic) simulations. Investigations are revealing information about the effects of the helidecks on the structural responses, the potential failure mechanisms of the studied lighthouses, and the way that the waves transform over the respective reefs which affects the resulting wave load. Wolf Rock and Fastnet lighthouses are now the focus of on-going monitoring. The video was produced by Filmbright Ltd as part of Creative Associates 2018, overseen by the University’s Sustainable Earth Institute and supported by Higher Education Innovation Funding (HEIF). It was also part-funded by the Marine Institute.